I decided to make another vegan reuben sandwich (again) after spotting and picking up some garlic sauerkraut at Whole Foods this weekend. 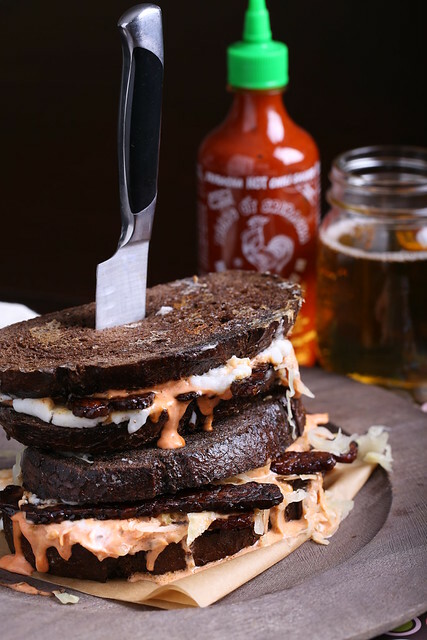 What differs from the last version is the addition of homemade vegan cheese instead of Daiya, which offered a new texture and richness that complemented the other sweet, briny, crispy, gooey, salty and spicy elements here perfectly. 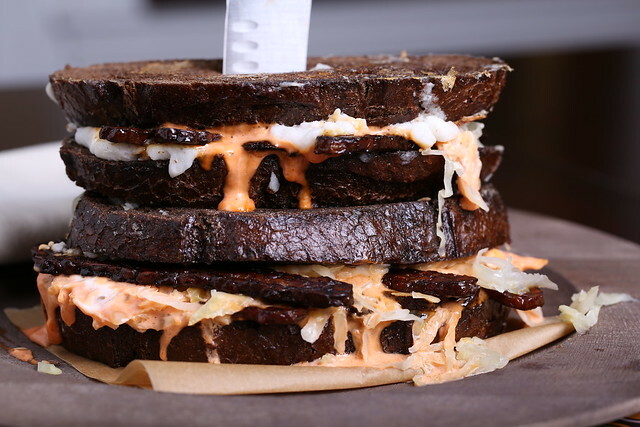 I love the sloppy look and feel of this sandwich, and mopping up the extra sauce and sauerkraut between bites is the best part of eating this. Combine all of the cheese ingredients small saucepan. Whisk briskly continuously until the mixture comes to a small boil and starts to pull away from the sides of the pan. Remove it from the heat and transfer it to a small pyrex dish. Allow to chill and slightly set for about 20 minutes. In a dry skillet, lightly toast the cumin seeds over medium heat for about 2 minutes. Set aside. Add about a tablespoon of olive oil to the pan over medium heat. Add the slices of tempeh and saute until nicely browned, about 5 minutes for each side. Before removing the tempeh to cool, sprinkle with a few dashes of liquid smoke and drizzle with a little agave syrup. Melt a little of the Earth Balance over a clean skillet. Place the bread on top and allow to toast for a few minutes. Flip it over, then spread some of the cheese over the top. Allow the other side to toast. Flip the bread over again so the cheese makes contact with the pan and slightly melts for 20 seconds or so. Remove from the pan. Lay several pieces of the tempeh on the bread. Top with sauerkraut and sprinkle with the toasted cumin seeds. Top with the sriracha-Vegenaise dressing. Serve warm. Seriously delicious! 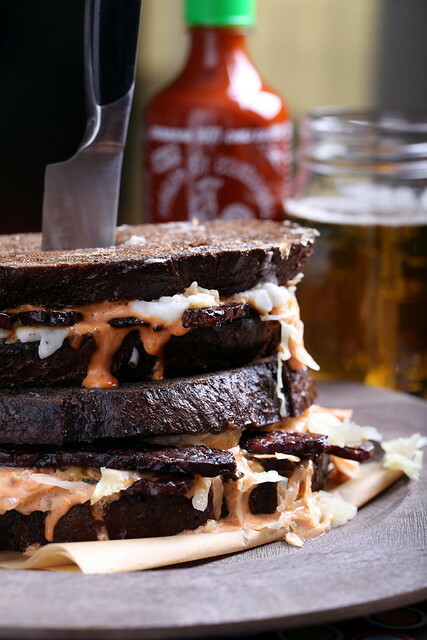 My husband is on a reuben kick, so we might have to add this on to our rotation! I hope you enjoy, Kier! i love how melty this looks! mmm! Woah, that looks SO GOOD!!! looks so messy and finger-licking good! that bread looks amazing, too. miss that pumpernickel bread.. I'm going to have to try this for the 'cheese' sounds like a WINNER! the reuben looks amazing Erin. Love the killer knife 😉 I think i m going to make grilled cheese sandwiches with the cheese and sriracha vegannaise! Ha! It is quite indulgent. I was full after eating this but not unpleasantly so. Definitely decadent! Can you post a picture of the cheese and what else it is good for? I am allergic to cows milk and I am always looking for substitutes. This actually seem like and easier and less expensive cheese substitute to make then some I have made in the past. Also if you want a great cannoli filling I created a great one a few years back and it is delicious. Most of my meat eating friends preferred it to the traditional filling. This looks amazing! No surprise I found your blog on pinterest! This looks/sounds great! Thanks for sharing this! Thanks for your feedback, Vicy — so happy you like! Just made this recipe, fantastic! Both myself and meat eater husband (and dog) loved it!! It was also easy to make, I left out cumin seeds because I am allergic and made my own maple tempeh. Hi! Quick question before I try the cheese, do you separate the can of coconut milk? When I opened it the liquid is on bottom and cream on top and wasn’t sure which part should be used for the 1/2 cup or if it should be mixed then measured. Thanks!!! Joleanna, you can just whisk the coconut milk until it’s uniform and then measure it out. I hope you enjoy!